Jeff Sherman has had his share of gut-check moments. Three years out of college, he discovered and went into architecture while working as a features associate at Vogue magazine. And, after wrapping up architecture school, he took a chance and cofounded the successful New York City-based firm Delson or Sherman Architectsin 1997. 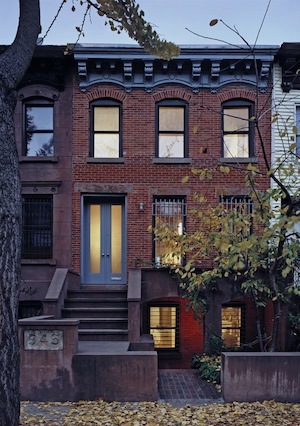 In 2000, he took on his most ambitious project yet: the restoration of a row house in Brooklyn’s Prospect Heights neighborhood. Originally built in 1910 and once the site of an illegal breeding kennel, it was a property likely to scare off even the bravest of home renovators, but Sherman bought it and spent the next 10 years of his life turning it into his gorgeous, light-filled home. Here, the architect details the aspects of the demanding project. Architect Jeff Sherman bought this row house, once an illegal dog-breeding kennel, and spent a decade polishing it into a warm, open living space. ABQ: How did you come to settle on the Prospect Heights Row House? What about it appealed to you? Jeff Sherman: I had only two criteria in my Brooklyn property search: it had to be mutable, and it had to be undervalued. Mutable because this might be my only chance to be my own client, so I wanted as much design freedom as possible. Undervalued because I had a small budget and I’m no fool. The minute I saw this house, I knew it was undervalued. It was in a bad neighborhood—underdeveloped with lots of vacant lots and auto body shops—surrounded by good neighborhoods. The law of averages was on my side. ABQ: Talk about what the Prospect Heights Row House looked like before the renovation. JS: The house was configured as three flats, but the previous owner had let it fall into floor-caving ruin. By the time I saw it, he was using it as a cage-free kennel, breeding giant attack dogs. Every horizontal surface was covered in dog poop. I put a shoveling clause in the contract. ABQ: Is the process different when you’re designing your own home? Is it easier or more difficult? JS: The main difference in designing for myself is that I could focus more on the architecture and less on programmatic requirements and resale value. I don’t have many needs, and I have no interest in luxury. What I care about is spatial excitement. My favorite works of architecture are all like that—spatially exciting—where you want to run from one spot to the next because each looks like more fun to inhabit than the last. Windows on row houses are typically only on the fronts and backs of the buildings, but Jeff Sherman put a skylight at the top of his row house to fill the deeper interior spaces with light. ABQ: Talk about the renovation itself. What did you want the final product to be like? JS: Row houses have some inherent liabilities. People talk about vertical living, but experientially row houses are actually spatially flat—one floor slapped on the next like a short stack of pancakes. And they’re dark in the middle because the only windows are on the short walls in the front and back. The conventional strategy with row houses is to push the living spaces to the windows and fill the middle with storage and bathrooms. But I had an idea that I could kill two birds by hollowing out the dark middle of the house and filling it with light from above. And that, as they say in architecture, was the parti. The house is organized around a two-story void lit by a long cut in the roof—a monitor designed to flood the void with winter daylight but filter [the] summer sun. On the parlor floor, the double-height space defines the dining room, which is otherwise open to the single-height kitchen and living room. On the top floor, the void separates front and rear bedrooms and is traversed by a catwalk. ABQ: What do you love most about the house? JS: I love my guest bathroom. Isn’t that funny? It’s the last thing I completed but the first with a budget decent enough to hire a terrific contractor. The inspiration came from an outdoor shower, the one luxury I really covet but not the most realistic fantasy for a Brooklyn backyard. Still, I thought it might be possible to recreate the experience indoors. To do so, I used an outdoor material for the floor, brick, not only for its looks but for the powerful sense memory it conveys through your bare feet. The ceiling-mounted showerhead is pushed close to the etched glass window but completely unenclosed within the room. No glass enclosure, no curtain, because the frisson of exposure is part of the outdoor-shower vibe. And the floor drain is slotted into the wall, leaving the floor unsullied while reinforcing that sense memory. The verdant backyard includes brick pathways and a small, protective trellis.